The Trump administration, lawmakers and corporate gatekeepers are issuing near-daily assaults on internet freedom, press freedom and our most vulnerable communities. Yet our activists are undaunted — in fact, just the opposite. Throughout the country, people have been making calls, signing petitions, visiting lawmakers’ offices and protesting. In the face of the Trump administration’s corruption and relentless attacks on fundamental rights and freedoms, the strength and scale with which people are fighting back is inspiring. And with Free Press’ membership on the rise and our network of allies expanding, we’re not just playing defense. We’re building toward the just and equitable media landscape people want, need and deserve. The Senate passed a resolution that would restore the FCC’s strong Net Neutrality rules, and support for a companion bill is building in the House. People are taking to the streets to protest Sinclair’s proposed takeover of Tribune. And the New Jersey legislature passed the Civic Info Bill — landmark legislation Free Press Action Fund conceived that will invest millions in local journalism and civic technology. On July 1, Gov. Murphy signed the budget that will fund it. At the same time, the FCC’s attacks on Lifeline, which subsidizes phone and internet access for struggling families, and its failure to address the communications crisis in Puerto Rico, are coming under increasing scrutiny from the public and lawmakers. At Free Press, we’ve proved time and again that we don’t give up and can win even under the most challenging circumstances. But we need an influx of resources to continue to mobilize and organize. And because Free Press and Free Press Action Fund refuse to take money from business, government or political parties (our independence is too important), we rely on your generosity to keep these campaigns going strong. When the Trump FCC voted to repeal the agency’s strong Net Neutrality rules last December, we sparked the effort to pressure Congress to reverse the FCC vote using the Congressional Review Act (CRA). All year, Free Press Action Fund and our allies have been mobilizing internet activists — with astounding results. Hundreds of thousands of people have volunteered alongside us to pull off events and actions throughout the country. We’re making enough collective noise for Net Neutrality to break through with the public like never before: Poll after poll after poll shows that people want Net Neutrality protections and are willing to fight for them. In May, we scored an unprecedented victory: The Republican-controlled Senate passed the Net Neutrality-saving CRA in a stinging rebuke to the FCC. Many said that victory would be impossible, but our grassroots campaign made it happen. 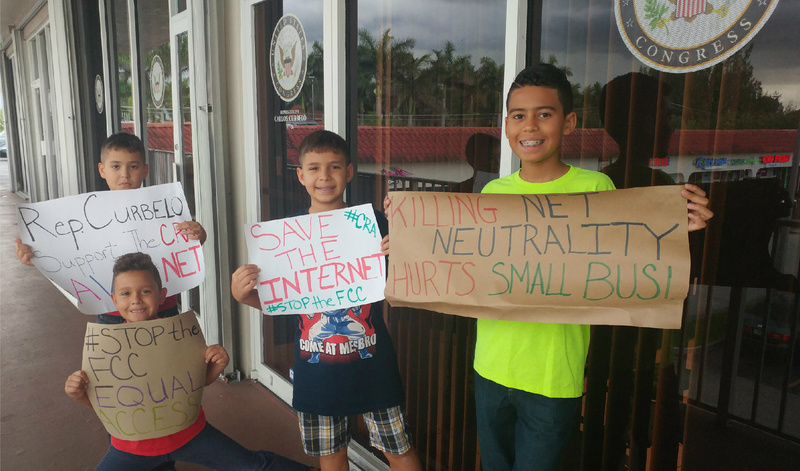 The Net Neutrality fight has inspired people of all ages to speak out. Now we face an even bigger challenge. On June 11, the FCC’s Net Neutrality repeal officially went into effect: AT&T, Comcast and Verizon are now free to destroy your internet experience. The stakes are high. 175 members of the House have signed the discharge petition that would force a floor vote on the CRA — but to move this forward, we need to get the support of at least 218 representatives. Leading outreach and lobbying on the CRA on Capitol Hill. Testifying in Congress and yet again making the definitive case for Title II Net Neutrality protections. 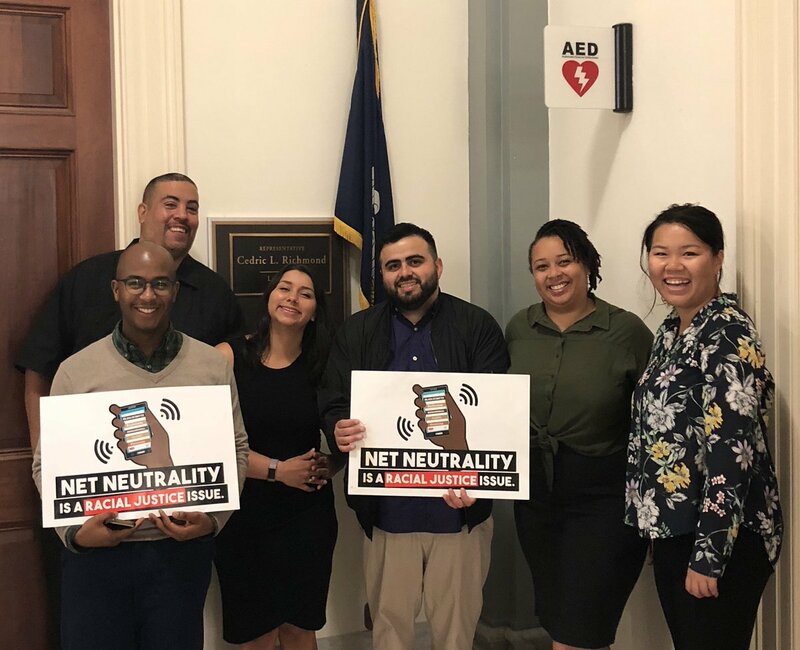 Organizing nationwide drop-ins to lawmakers’ offices with our Team Internet partners and mobilizing local communities across the country to make their voices heard. We’re zeroing in on lawmakers in key districts this summer, using innovative peer-to-peer texting tools to increase our reach and impact. The Voices for Internet Freedom coalition lobbies for the online rights of people of color. Saving Net Neutrality is vital because at its core it’s about preserving digital civil rights. But time is running out: The House has until the end of the year to take action on the CRA, but this summer presents our best window for passing it. Support for Net Neutrality is also gaining steam at the local and state levels. 125 mayors have signed our Cities Open Internet Pledge, vowing that they will refuse to do business with any internet service providers that violate open-internet principles. Both Oregon and Washington State passed Net Neutrality laws (with bills pending in at least 20 more places), and the governors of six states have signed executive orders to protect the open internet. That’s not all: We’ve sued the FCC over its unjust Net Neutrality repeal. The court case is expected to get underway this summer and to be heard by the end of the year. We’re working alongside 23 state attorneys general and a coalition of public-interest groups to draft briefs, vet legal arguments, and challenge the FCC’s decision. 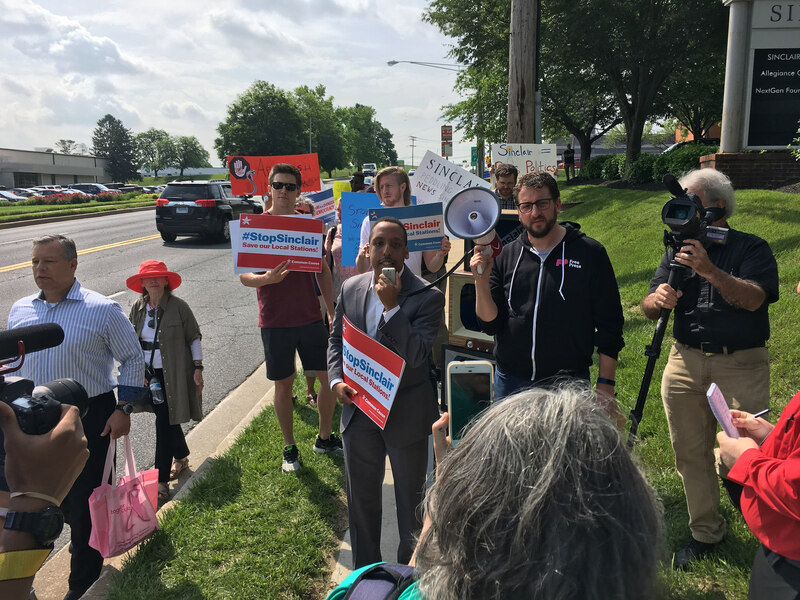 Activists gather outside Sinclair headquarters to stop the company from taking over local TV. Free Press envisions a media system that is owned by many, telling the stories of all. We believe that people deserve news they can trust. For more than a decade we’ve been working to stop media conglomerates from destroying local media and silencing independent and marginalized voices. That’s why derailing the Sinclair Broadcast Group’s proposed takeover of Tribune is a top priority. The company forces its stations to air hateful, pro-Trump commentaries daily over the objections of local journalists. Most recently this included a segment that defended the administration’s zero-tolerance policy toward migrant families. If this merger goes through, Sinclair’s right-wing, racist and Islamophobic programming would reach 72 percent of U.S. households. Earlier this year, the broader public got engaged in the fight to stop the Sinclair merger after Deadspin released a video showing local Sinclair anchors reading from the same propaganda script. The video dominated social media — to the point where even Donald Trump tweeted in Sinclair’s defense — and exposed the company’s propaganda to millions of new people. While the public is outraged, FCC Chairman Ajit Pai has been bending over backward to help Sinclair do whatever it wants. In 2017, the FCC gutted longstanding media-ownership rules to pave the way for the merger. It also reinstated an obsolete regulation — the UHF discount — to help broadcasters like Sinclair expand their empires. And it rolled back rules requiring broadcasters to maintain studios in the communities where they’re licensed to operate. Allowing a handful of corporations to control the media is — like repealing Net Neutrality — part of Chairman Pai’s democracy-bulldozing agenda. Sued the FCC over reinstating the UHF discount. Then in March, we sued the agency again over its rollback of media-ownership rules. Helped drive nearly 100,000 public comments to the FCC opposing the deal and organized a coalition of civil-rights and public-interest groups to stop it. 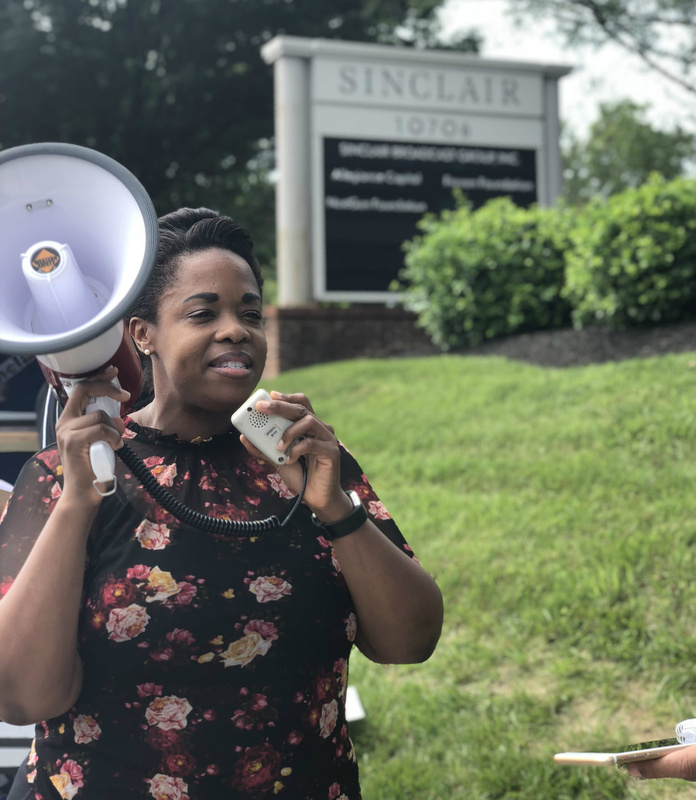 Organized a lively protest outside Sinclair’s headquarters during its annual shareholders’ meeting. Demanded that Pai recuse himself from any decisions relating to this merger while the FCC’s inspector general is investigating him for potential conflicts of interest. 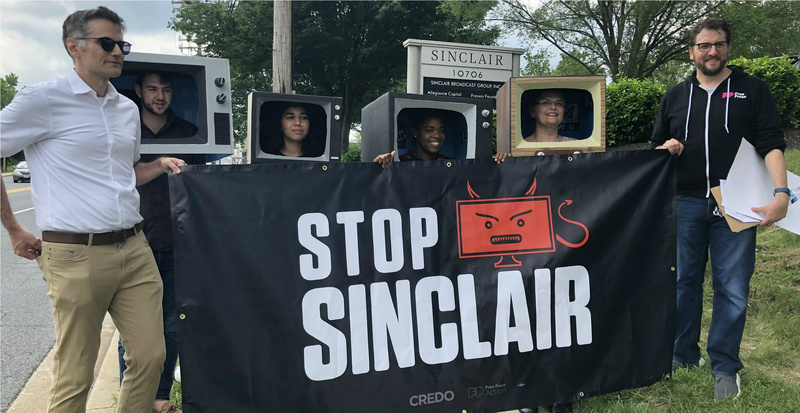 We’ll be intensifying our campaign in the coming months to stop Sinclair from taking over the local airwaves — and are gearing up to organize in the markets this dangerous company is trying to take over. Our News Voices project brings residents and reporters together to transform local news and elevate the voices of everyday people. In New Jersey, where we first launched the project, we’ve spearheaded landmark legislation that would help revive local news throughout the state. The Civic Info Bill will create a public fund to invest millions of dollars in innovative projects designed to strengthen local news coverage and boost civic engagement. The fund this legislation will create — the Civic Info Consortium — will make New Jersey a national model for how to give people the news and information they need to participate fully in our democracy. When we conceived the Civic Info Bill in 2016, few thought it would see the light of day. We fell short of passing it in 2017 but kept pushing. In June 2018 — after months of intensive public outreach, organizing and lobbying in the statehouse — the bill was included in the state budget and passed the state legislature. Gov. Murphy signed the budget that will dedicate $5 million to the public fund. This is a historic victory. 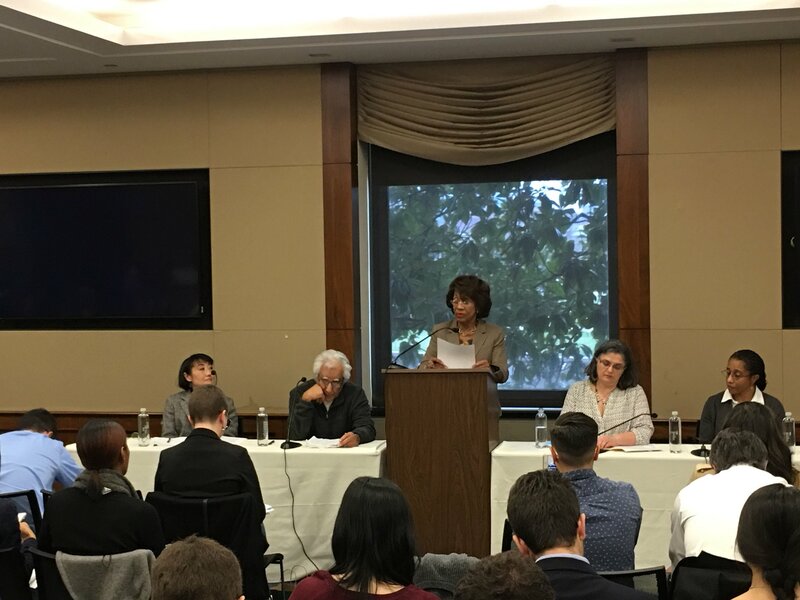 Rep. Maxine Waters discusses the impact of the FCC's war on the poor. The ability to connect and communicate can be a life-and-death issue. But instead of working to bridge the digital divide and safeguard civil rights online, FCC Chairman Pai has endangered the most vulnerable communities. Pai wants to dismantle Lifeline, a federal program that subsidizes phone and internet access for millions of families living below the poverty line. The rollback would make it that much harder for poor people to connect with their families, access educational and economic opportunities, or even make lifesaving calls for help. And it would disproportionately harm domestic-violence survivors, Native Americans, single parents, unhoused people, people of color, and elderly people. In February, Free Press submitted filings at the FCC that make the definitive case against Pai’s cruel plan. All year, we’ve been mobilizing activists to pressure the FCC to leave Lifeline alone. 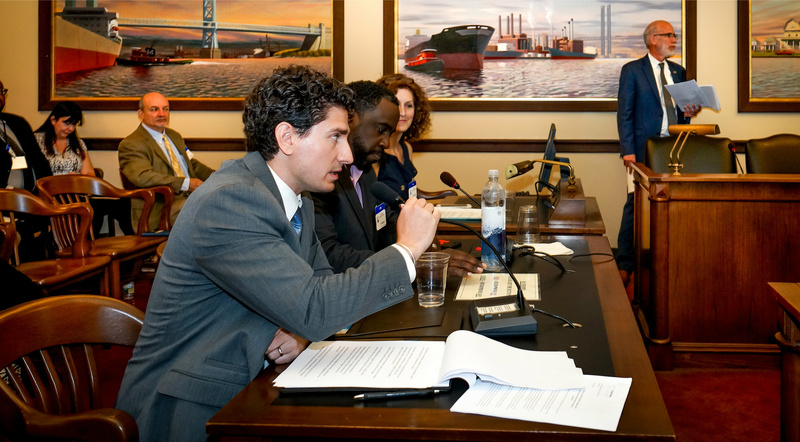 We also organized high-profile events on Capitol Hill with members of Congress and FCC commissioners alongside Lifeline users. Pai’s plan to gut Lifeline would also disconnect hundreds of thousands of people struggling to recover in hurricane-stricken areas like Puerto Rico and the U.S. Virgin Islands. To tell this crucial part of the story, we collected testimonies from Puerto Ricans affected by the lack of communications support in the wake of Hurricane Maria. 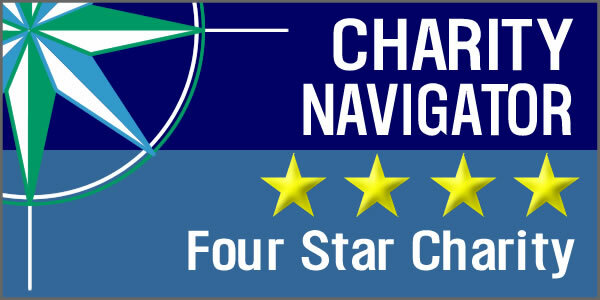 Create comprehensive disaster-preparedness and recovery plans. Fulfill its responsibility to restore and safeguard telecommunications in Puerto Rico. Abandon efforts to destroy the Lifeline program, which would undermine Puerto Ricans’ efforts to recover from the hurricane. As we head into the second half of 2018, Free Press is developing a comprehensive campaign to reshape narratives around internet access and push for policies that will bridge the digital divide and ensure that everyone has access to high-speed broadband. None of this work would be possible without people like you. Your generosity has kept us going strong for 15 years and your continued support is essential to our future success. Thank you!